British media outlets published reports on the latest violence between Israel and Gaza terror groups, characteristically muddling the sequence of events by highlighting the Israeli response to Gaza terror, whilst downplaying or ignoring completely the terror itself. On Friday night, an Israeli soldier was moderately wounded by shrapnel from a grenade lobbed at him from the northern Gaza Strip during violent riots by thousands of Palestinians at the border. Early on Saturday morning, the IDF attacked sites used by Palestinians to build and distribute incendiary kites – bombs which have caused thousands of fires and destroyed over 7,400 acres of land, context regarding the current tensions between Israel and Gaza largely ignored by the media. Israel’s air force also bombed two attack tunnels near the border. 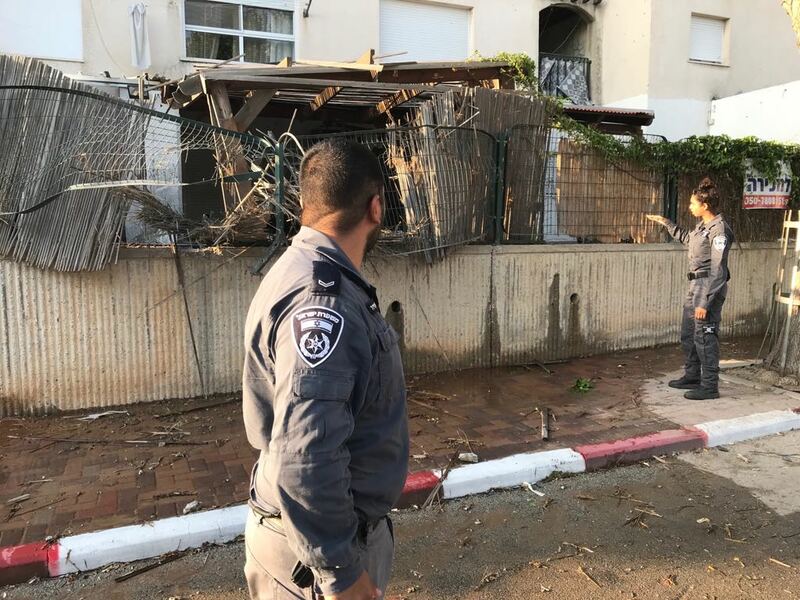 Later Saturday morning, terrorists fired scores of rockets on Israeli communities in the south, forcing thousands to flee for bomb shelters, and included a direct hit on a home in Sderot, injuring four members of the same family. In response, the IDF launched “its largest bombing campaign against Hamas targets…since the 2014 Gaza war” hitting dozens of military sites. More rockets were fired from Gaza late Saturday night, but a ceasefire, negotiated by Egyptian intelligence and the UN secretary-general’s envoy to the region, slowly took hold. The ongoing Hamas kite bomb campaign, which cause up to 20 fires in Israel a day, continued. Ongoing, Hamas inspired, Palestinian violence at the Gaza border continued on Friday, and included a grenade attack which injured an Israeli soldier. IAF launches a limited number of attacks on Hamas military positions in response to the grenade attack. Hamas and Islamic Jihad launched nearly 200 rockets at Israeli communities along the south, injuring three civilians. IAF launch over 40 attacks on Gaza military positions, including a direct hit on a Hamas battalion command in northern Gaza, which was completely destroyed – though fighters had evacuated the position and nobody was killed. Here’s a quick run down of the headlines. Some failed to convey the accurate sequence of events, whilst others actually ignored entirely the Gaza terror attacks which precipitated the violence. There’s no mention, in the headline or strap line, of the initial Hamas rocket attacks or the grenade attack on Friday. The image depicts an attack on Gaza, rather than rocket attacks on Israel. 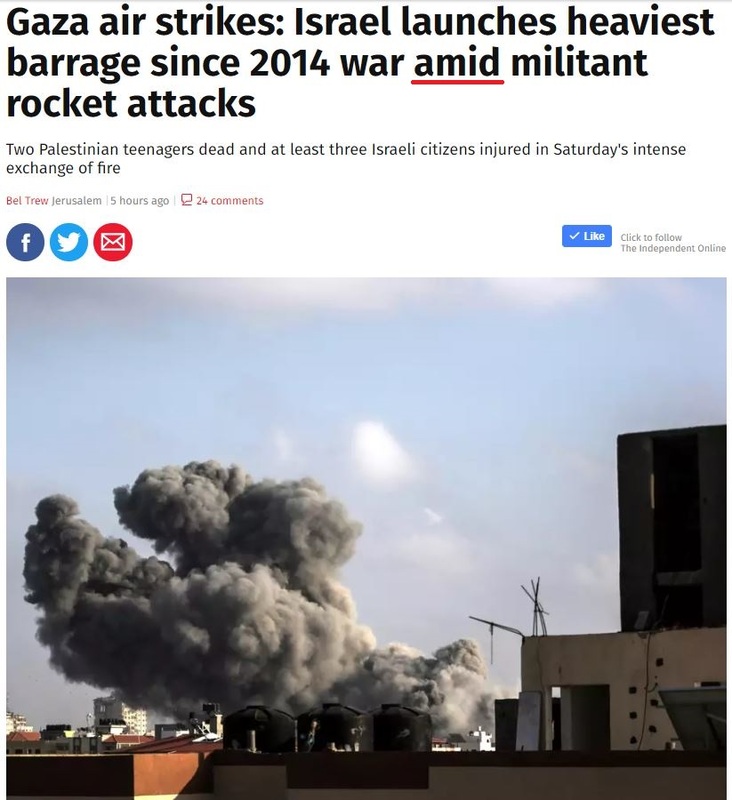 Also of note: The article was by Associated Press, but Guardian editors changed AP’s original headline (“Israel exchanges intense fire with Hamas militants in Gaza”) which was much more fair in noting the exchange of fire between both parties, not merely the Israeli response. There’s no mention whatsoever in the headline of the Hamas rocket attacks. Also, the image actually depicts women in Gaza grieving the death of a Palestinian teen who participated in violent riots on Friday along the border, and isn’t related to the IDF’s subsequent bombardment of military targets in Gaza on Saturday. 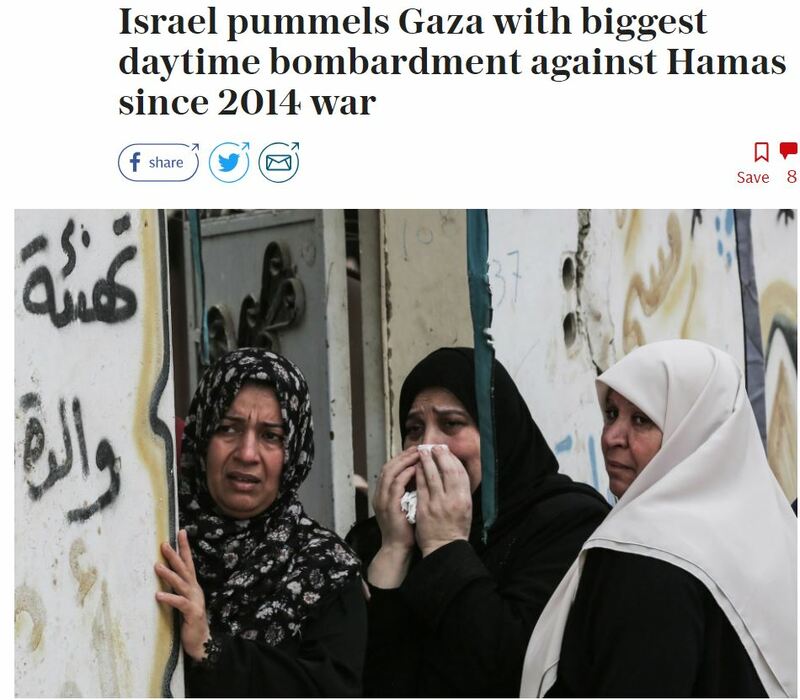 Though the article itself actually gets the sequence of events correct, the headline and photo focus entirely on the Israeli response to Hamas attacks. 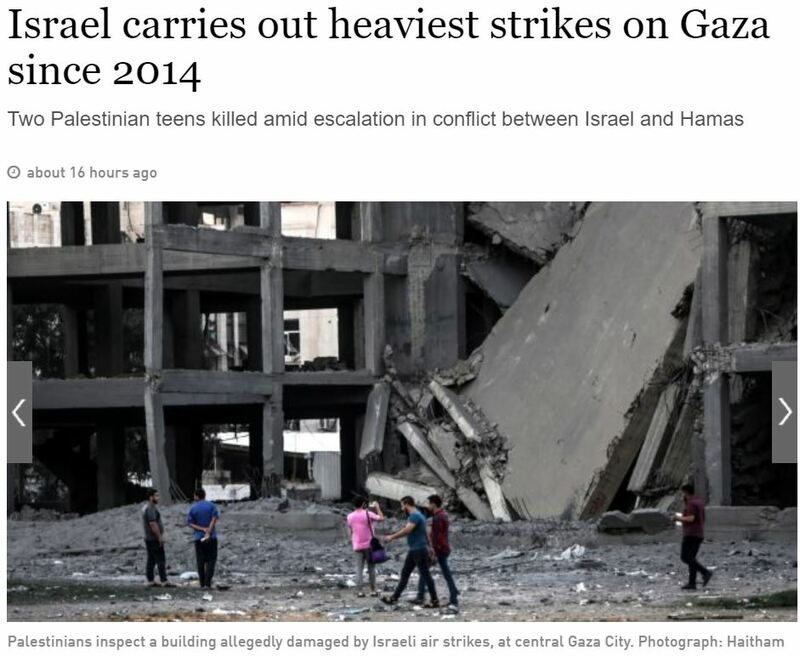 This headline is better than the Guardian, Telegraph and Times of London as it actually notes the Gaza rocket attacks. The image, however, depicts an Israeli attack on Gaza, rather than the damage done by rockets to Israeli communities. More of the same, with the headline and photo focusing entirely on Israel’s response to Gaza terror. Sky showed, without context, an IDF video showing an attack on military targets in Gaza. There’s no mention of terrorist rocket attacks on Israel, nor any context whatsoever. Most outlets illustrated their articles with photos that focused entirely on the damage in Gaza, and Palestinian suffering, despite a plethora of images and videos shared on social media showing damage to Israeli civilian communities from the rocket attacks. 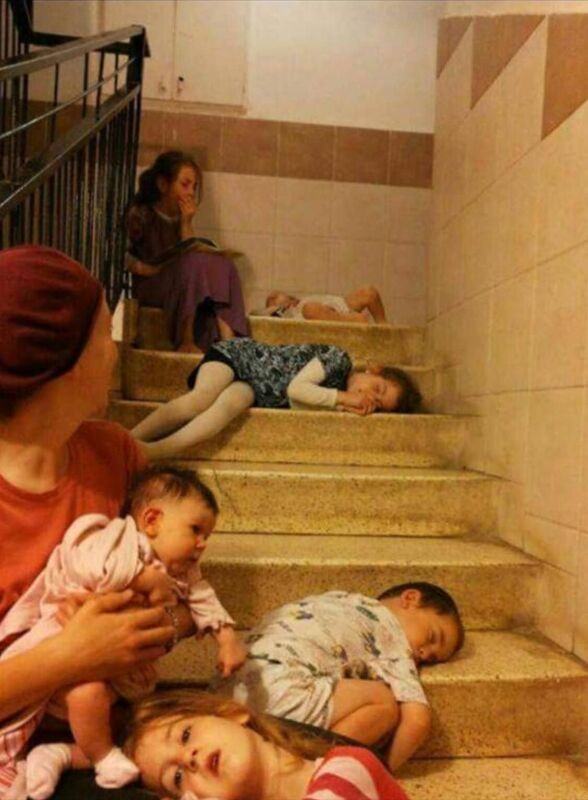 An Israeli family takes cover in a stairwell amidst Hamas rocket attacks. 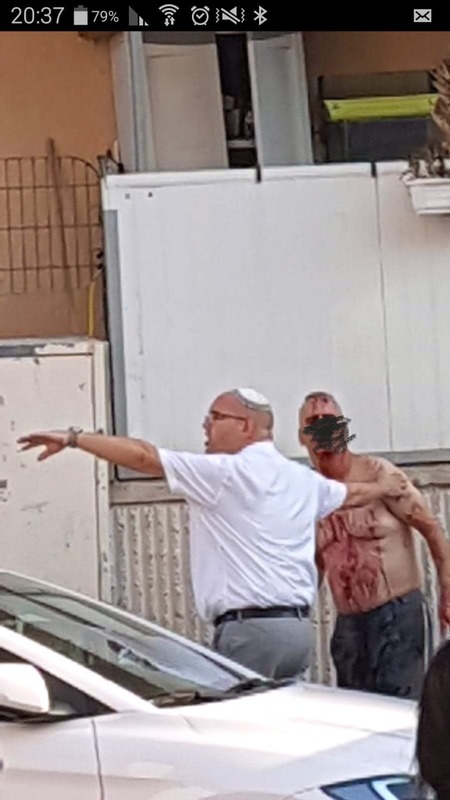 An Israeli man in Sderot injured by rocket shrapnel. Israeli man narrowly escapes rocket. Hamas rocket hits playground in Sderot. Western Media loves to blame spilled blood on Jews. Which means nothing has changed in over 2000 years, just the channels. Does the BOD or the JLC or the ZF plan to hold a demo outside the premises of any of the MSM saying enough is enough when it comes to biased reporting? Just how long are we going to suffer this in silence? Of course the Limeys have always blamed us whenever we shoot back and never bother with the Islamofascist attacks. Of course the coverage is slanted. Israel is at war with a close ideological ally of the British press, i.e., Hamas. Facts don’t matter to the joke of journalism that is the British press. Great article and video’s showing how Hamas fires missiles from schools, hospitals and other civilian area’s at Israel.